Leh Ladakh is one of the best tourist destinations located in the north India. Nestled in the snow-capped Himalayas, Leh Ladakh have been the centres of Tibeto-Buddhist culture since the bygone days. If you have faith in meditation and spiritual healing then you can attend the special meditation sessions held at some Buddhist centers. A tour to Leh Ladakh is also the favorite of adventure lovers; known for some of the best hikes in the country. The Karakoram ranges in the north and the Himalayas in the south border Ladakh. With the great Indus passing through Ladakh, it divides the province into Leh, Nubra, Zanskar, lower Ladakh and Rupshu. The distinct features of Ladakh are its uplands, craggy, barren cliffs and plateaus. Ladakh is governed by an extreme cold and dry climate. A tour to Leh Ladakh India coincided with the colourful festival of Ladakh make your journey memorable. The mask dance and peacock dance during the festival procession are the most capturing moments in Leh Ladakh. The place is also a pilgrim center for the disciples of Buddhism. The adventure and water sports in the mountain ranges in Leh Ladakh; and the Zanskar and Indus River make your Leh Ladakh tour more exciting and thrilling. After becoming the regional capital in the 17th century, under the reign of King Sengge Namgyal; Leh blossomed into one of the busiest markets on the Silk Route. Leh's prosperity came to an abrupt end with the closure of the Chinese border in the 1950s. It was in 1974 that Leh was opened up for foreign and domestic tourists. The Leh Palace is one of the major attractions here in Leh Ladakh. Even though in a dilapidated condition, the palace built in the 17th century attracts the tourists to view the majestic structure. The Victory Tower at the top of the Namgyal hill built to commemorate Ladakh's victory over the Balti Kashmir armies in the early 16th century is another must visit. The Namgyal Tsemo Gompa, built in 1430, contains a three-story high Buddha image and ancient manuscripts and frescoes. One can also have breathtakingly beautiful views of Leh from the fort above this gompa. Leh is a trekker's paradise. The treks from Spituk to the Markha valley and Lamayuru gompa to Chiling village alongside the Zanskar River are the most popular treks in the region. Another trek route is from Likir to Temisgam. Treks are open from the June end upto mid October. The passes for trekking are as high as 5,000 m in altitude. Many trekking agencies in Leh offer trek packages with a guide, packhorses, food and supplies. Besides trekking, polo is also equally popular in Leh. Apart from a well-maintained polo ground, regular matches and competitions are organised during the Ladakh festival. From July to September, one might also take fun of rafting in the Zanskar River. 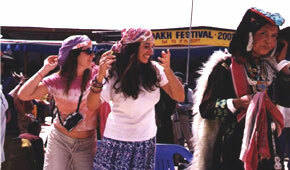 The Ladakh Festival is now a regular tourist event at Ladakh. The adventure tourism is also a well-developed stream in Ladakh. A white water river rafting expedition along the 26-kilometre stretch from Fhey to Nimo along the mighty Indus River is a thrilling experience for the tourists coming to Ladakh. It is the highest river rafting point in the world. The high altitudes and the surrounding mountains make Ladakh an ideal spot for paragliding, mountaineering, trekking and even skiing. You can also enjoy archery competitions and polo in Ladakh. Leh is directly connected to Delhi through regular flights. There are also direct flights once a week from Leh to Srinagar and twice a week to Jammu. 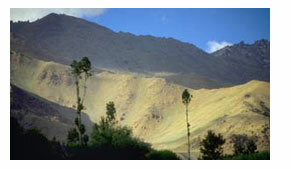 There are two overland routes to Leh-the roads from Srinagar and Manali. While the Leh-Srinagar route is operative from June to October, the Leh-Manali route is operative from July to September. To reach Ladakh, the nearest airport is Leh. The flights from Delhi, Chandigarh and Srinagar take you directly to Leh. The adventure seekers can opt for a two-day journey from Srinagar to Leh (434 kilometers) with an overnight halt at Kargil.